Next, lets look ACROSS Petermann from roughly the same latitude. This perspective is more dramatic as vertical cliffs give shape, cliffs are cut by smaller side-glaciers. 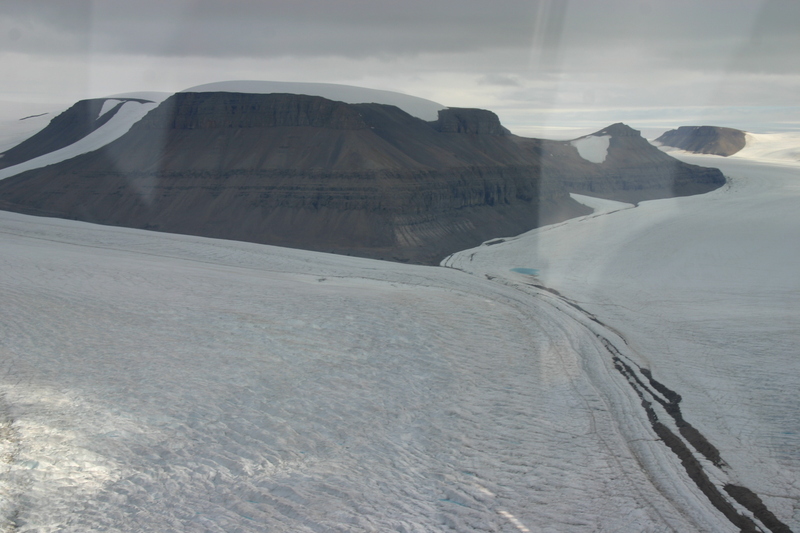 More specifically, we see the CCGS Henry Larsen helicopter flying down Belgrave Glacier as we look across Petermann which flows from the Greenland Ice Sheet on the left out to sea on the right. On the other (south-western) side we see Faith Glacier in the background about 10 miles away. Contrasting large Petermann Gletscher, the many smaller glaciers on both its sides evoke drama as ice plunges down from 3000 feet above in a rage of forms, colors, and shapes. These side glaciers have their own side glaciers that sometimes rival the Alpine glaciers in Europe, Asia, and the Americas that most of us are more familiar with. 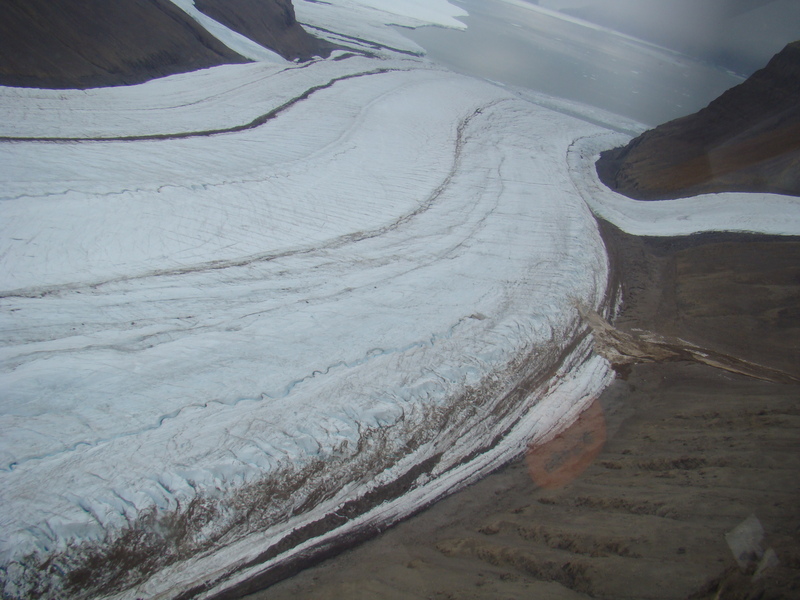 Some side glaciers have names, but they are rarely seen on maps and charts. The side glaciers are mapped, but photos are hard to find. Flying over them last year, I was utterly lost. Reviewing photos now, I remember people, smells, computer troubles, and exciting ocean discoveries. Nevertheless, I am hard pressed to place the places we saw on a map or name them. Distances are deceiving, the air is clean and 50-80 miles of visibility are common. A moment later, I cannot see the other side of the ship as we are suddenly in clouds and fog. Everything is always in motion, the ice, the water, the ship, the clouds, all of this without strong reference points like the exit or distance signs on a Turnpike, Interstate, or Autobahn. 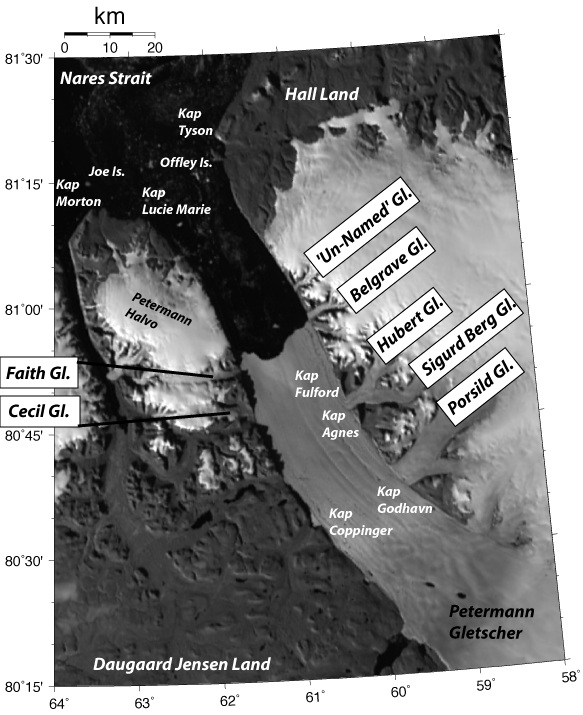 Petermann Gletscher and suroundings extracted from U.S. Defense Mapping Agency Chart ONC A5 (January 1991). Petermann Gletscher extend and topography from 1953 through 1978 (from Higgins, 1990) with 2012 terminus position drawn in by hand. With all these details out-of-the-way, we can now start placing photos into places and add names to them. 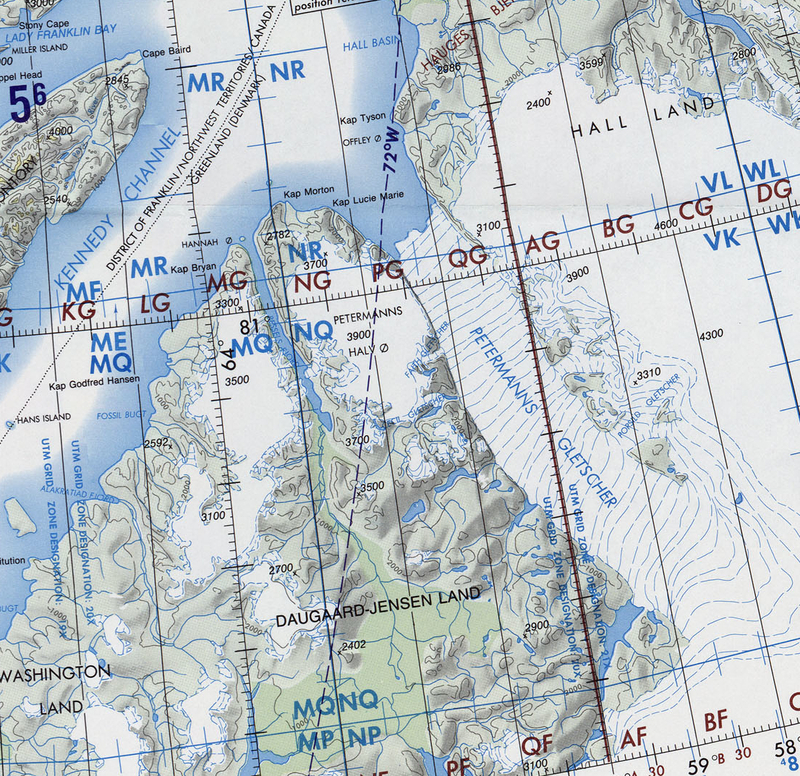 Perhaps others like Espen Olsen can write or edit Wiki entries or correct the false latitude and longitudes that populate the many databases that provide such information on the web. Over the next weeks and months I will try to post as many photos of Petermann’s natural beauty along with an evolving MODIS map that names and shows places. Here are just a few teasers without further comment except what’s in the captions. 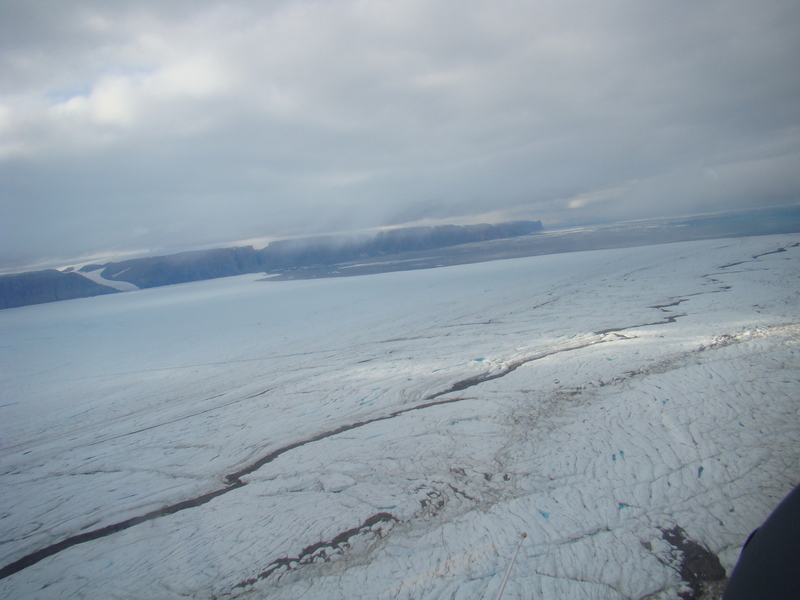 This entry was posted in Greenland, Ice Island, Nares Strait 2012, Petermann Glacier and tagged glaciers, Greenland, helicopter, ice island, Nares Strait, NASA, Petermann. Bookmark the permalink. Thank you for sharing. The claim that the 2012 ice island being half the size of Manhattan is wrong by a factor of 4, though. PII2012 is half the area of PII2010 which was about the size as four Manhattan’s. The mass estimated from combining area with thickness estimates from radar and lidar measurements is almost identical in 2012 as it was in 2010. 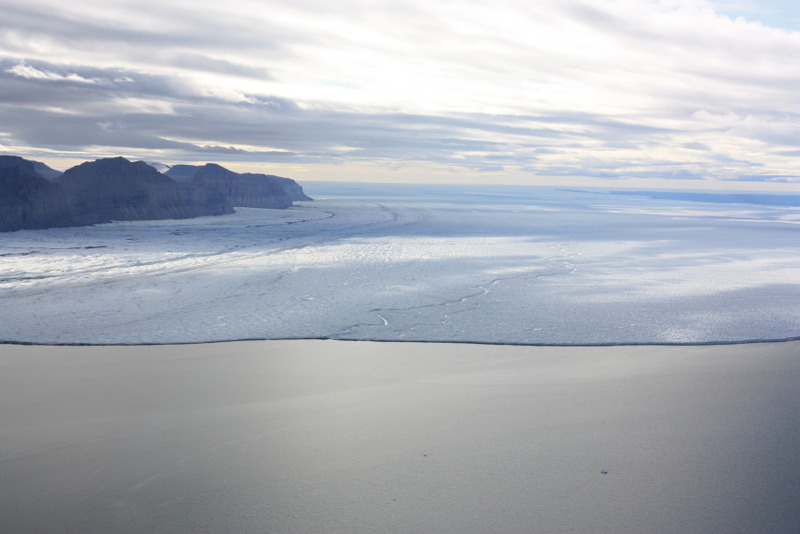 Do you have an estimate of when the 2012 ice island might reach the coast of Newfoundland? I think there will be a steady stream of ice islands from Petermann reaching the coast of Labrador and Newfoundland for the next several years. 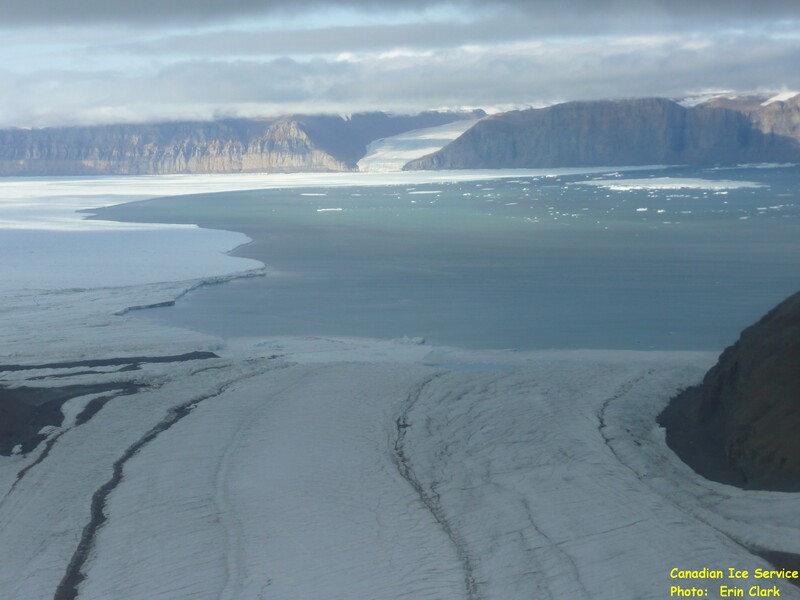 Pieces of the 2012 ice island may not get there until next year or the year after, but most of the 2010 Petermann ice island (PII2010) has not yet arrived either. 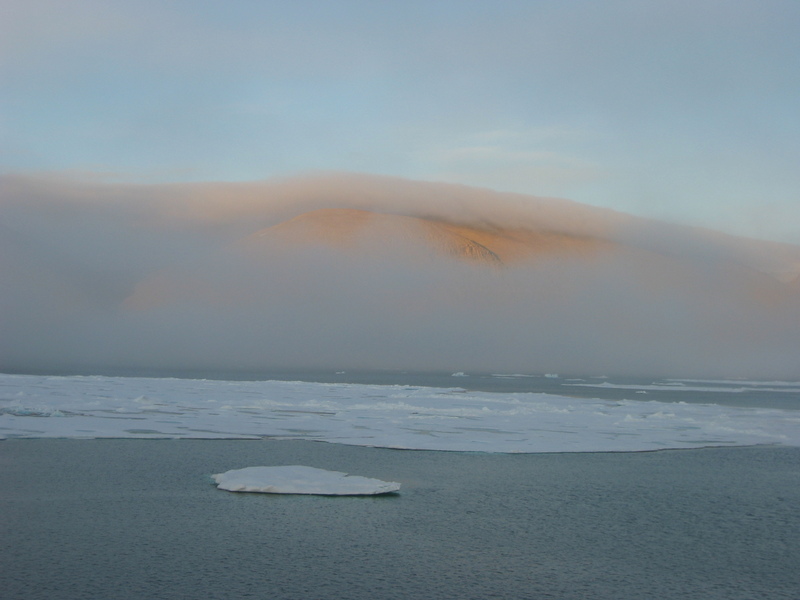 Many of its thicker segment are still in transit as they grounded off Baffin Island. The July/Aug 2011 arrival of PII2010-A was a first of many more pieces of the 2010 ice island to come. Perhaps not all may come ashore as close as PII2010-A did, but nobody can predict that more than a month ahead of time. In a nutshell: I do not really know, but July and August are always good times to be in Newfoundland to watch ice, ice bergs, and now ice islands from Petermann as well. Thanks for this. We get a lot of people asking if any particular year is good for bergs, and we always say “it’s too soon to tell.” Last year I flew to Europe through Iceland and there were THOUSANDS of icebergs between Greenland and Iceland. We get relatively few by comparison.